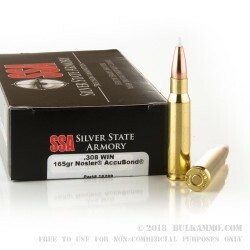 Flex those shooting skills and bring home a trophy with the help of this .308 Winchester ammunition from Silver State Armory, a subsidiary of famed bullet manufacturer Nosler. 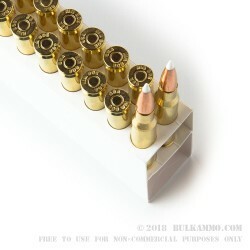 Assembled in Packwood, Washington, these cartridges propel a heavy 165 grain hollow point bullet at a muzzle velocity of 2,675 feet per second and deliver deadly long-range accuracy and terminal ballistics. 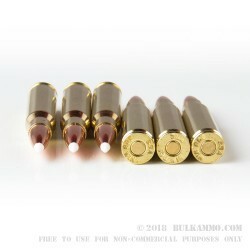 This ammunition uses Nosler's AccuBond bullet, a bonded-core design that exhibits excellent weight retention and takedown power against deer and other game. 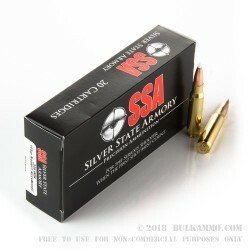 Like other Silver State Armory product, these cartridges use non-corrosive Boxer primers and brass cases.